Coal Scuttle. Chocolate Store, the online candy store with chocolate and candy. 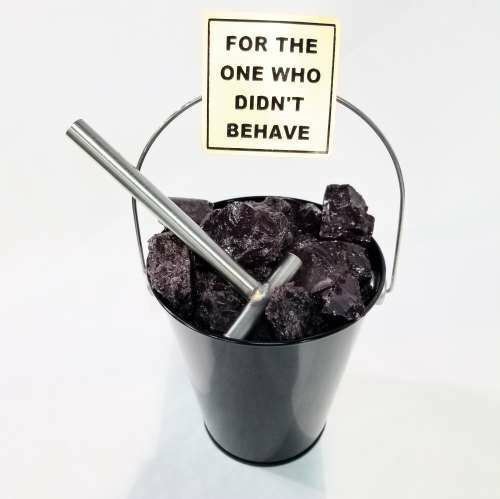 Coal Scuttle / Coal Candy – Well…. your Mom always threatened to put a lump of coal in the bottom of your Christmas stocking if you were bad, but she never followed through because she couldn’t find the coal. Now you would be in real trouble because we have the coal. The best part of our coal is that it is licorice flavored hard candy. It comes in a miniature scuttle complete with a small hammer to break up the “coal”. It is a really “fun” punishment. Licorice hard candy. For the one who didn't behave. 8oz of licorice candy. Stainless steel hammer is about 4" inches long (100mm). Metal bucket is about 4" inches (100mm) high or about 8" inches (200mm) with the handle up as in the main photo.